Use this mask to put on a play or to brighten up a rainy day! Remove the elastic cord from your plastic mask and set aside for later. Use a foam brush to paint a white mask with pink Acrylic Paint. Draw and cut wing shapes on pink construction paper. For your convenience, we have created a free template you can follow. Click the “template” button under the finished project to download. 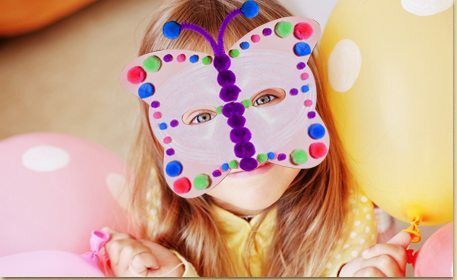 Once the mask is dry, glue these pieces to the back of the plastic mask to create your butterfly shape. Glue several purple small poms down the center of the mask to create the butterfly body. Fold a 4 inch piece of purple Fuzzy Stick in half and attach to the top of the mask. Add (2) blue small poms to create the antennas. Decorate your mask with additional small and tiny poms. On our version, we created an outline shape with the poms to decorate the butterfly’s wing. Once dry, reattach the elastic cord and get ready to put on a butterfly themed play!